From puppet parades to circus acrobatics, here’s what’s on in the coming months. Happy spectators at the 2016 Laya Street Performance World Championships, part of City Spectacular. WITH THE WEATHER heating up, planning family days out gets easier, but it’s still a challenge to find kid-friendly activities that don’t involve dropping €15 or €20 a ticket. When you factor in food, entry fees and the inevitable face-painting or funfair rides, the costs can add up fast. 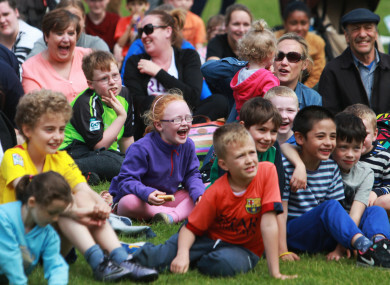 To ensure you and your crew have fun during the summer holidays without spending heaps, we’ve rounded up the best free family-friendly events on around Ireland in the coming weeks, and we’ve detailed how to get there using your Leap Card or Child Leap Card too. Laya City Spectacular: Ireland’s biggest free summer festival is back this year, with three days of outdoor acrobatics, dance, juggling, food, a pet area and family activities. If you can’t make Dublin, it’ll all be happening again at Cork’s Fitzgerald Park on July 14 and 15. Suits: All ages. When: July 6 -8. Where: Merrion Square, Dublin. Getting there by Leap Card: Dublin Bus routes 4, 7, 25, 26, 44, 66, 77 and Green Line Luas. Festival of Curiosity: This year, another round of “playful days and curious nights” hits Dublin city, with a range of science, arts, design and tech events for adults and kids in venues around the city. Some, like the “giant bubble art” show at the National Concert Hall, are ticketed, but most are free. Suits: All ages. When: July 19 – 21. Where: Venues across Dublin city. Getting there by Leap Card: Dublin Bus, Green Line Luas, Red Line Luas, DART. The Wobbly Circus Show: Seasoned circus performers The Wobbly Circus bring their skills to Fitzgerald’s Park this July, with three ninety-minute weekend events featuring tightrope walking, fire juggling and plenty of clowning around. Find more Summer In The Park events here. Suits: All ages. When: July 1, 7 and 21. Where: Fitzgerald’s Park, Cork. Getting there by Leap Card: Bus Éireann routes 205, 208, 201. Cork Puppetry Festival: Head to Bishop Lucey Park or Fitzgerald’s Park this August Bank Holiday Weekend for a series of performances from the Cork-based Dowtcha Puppets. Kids will also learn how to make their own puppets – and will get to show them off at Cork’s first ever Puppet Parade at Fitzgerald’s Park. Suits: All ages. When: August 3 – 5. Where: Bishop Lucey Park and Fitzgerald’s Park. Getting there by Leap Card: Bus Éireann city centre routes for Bishop Lucey Park, and routes 205, 208 or 201 for Fitzgerald’s Park. The People Build: Have a child who loves a bit of stomping around? Returning for this year’s Galway International Arts Festival is The People Build, giving locals and tourists the chance to help artist Oliver Grossetete recreate famous Galwegian landmarks out of boxes. And afterwards? You’ll get to demolish them all. Suits: All ages. When: Workshops July 13 – 19, construction/demolition July 20 – 23. Where: Venues across Galway including Waterside. Getting there by Leap Card: Bus Éireann routes 401 – 410, City Direct routes 411 – 414. Suits: Under-sevens. When: Year-round. Where: Mill Rd, Corbally. Getting there by Leap Card: Bus Éireann route 301. Waterford Walls: The city of Waterford will be transformed into an ‘open air gallery’ this August, with over 50 artists painting murals and creating street art across the nine-day event. Come along and watch them at work – and soak up the festival atmosphere. Suits: All ages. When: August 17 – 26. Where: Venues across Waterford city. Getting there by Leap Card: Bus Éireann routes 360, 360a, 601 – 605. Free Wednesdays at OPW sites: The continuation of Heritage Ireland’s Free Wednesdays scheme has just been confirmed for the summer months. On the first Wednesday of each month, you can visit certain OPW sites absolutely free, including Dublin’s Farmleigh, Galway’s Portumna Castle and Gardens and Waterford’s Reginald’s Tower. Find the full list here. Suits: All ages. When: First Wednesday of every month. Where: Venues nationwide. Getting there by Leap Card: Dublin Bus, Bus Éireann, Luas, DART, Commuter Rail. To make your summer travel even easier, let the Kids Go Free. This summer, children under 19 can travel free with a Child Leap Card from July 2 – 15 2018, inclusive. Simply use your Child Leap Card as normal on Dublin Bus, Luas, DART, Bus Éireann, Commuter Rail, Ashbourne Connect and more. If you don’t have a Child Leap Card yet, you can buy one here. Email “8 totally free family events you can get to using a Leap Card this summer”. Feedback on “8 totally free family events you can get to using a Leap Card this summer”.